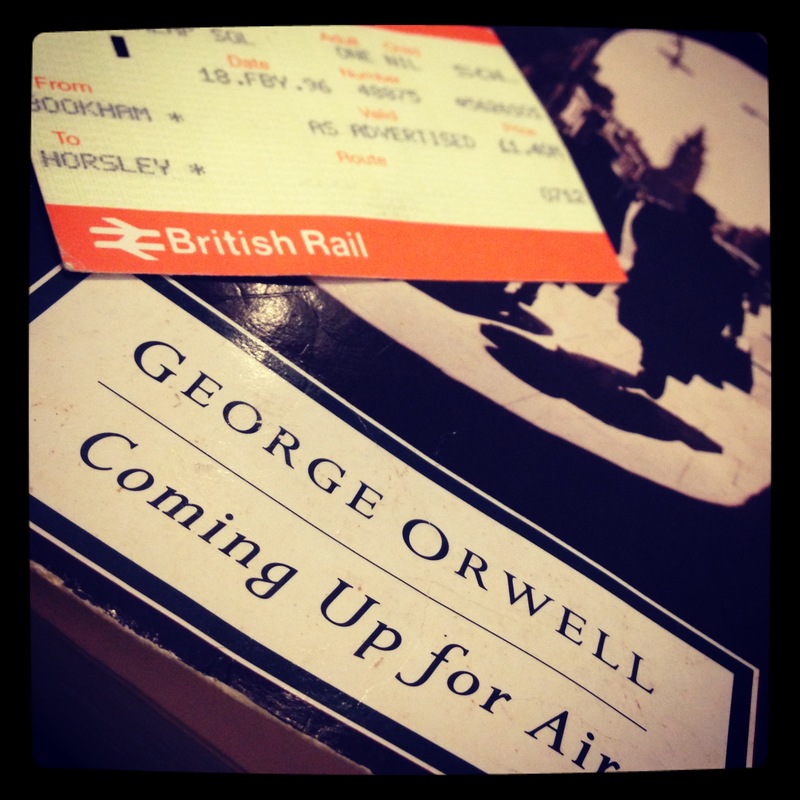 George Orwell – Coming Up For Air. As last winter continued on into spring this years reading time was prolonged as the urge to get out was limited to some pretty miserable weather. On the one occasion that I did fight through the driving wind, rain and leaden skies was to make it down to Spitalfields Antique Market on a thursday in late April to see my friend John Andrews and his excellent stall of fishing tackle for the soul. Over a cup of tea the conversation drifted into books and my urge to read some Orwell. John mentioned that I should read Coming up for Air, a slightly more obscure book but had the added bonus of some very well written passages on his childhood obsession with fishing. So after a quick hunt around the market and then back home to the internet I finally found myself a secondhand copy for a few quid. Straight away I got stuck into the book and then something happened…we had a summer and the book got placed out of harms way high on a bookshelf. Only now in late September has the summer truly ended, the evenings have moved back indoors. So while I was looking for something to read I came across Coming Up For Air once again and immediately got stuck into this absorbing book. Orwell has an un-laboured way of writing which is very easy to read, he is able to conjure up vivid detailed scenes full of mood and atmosphere. 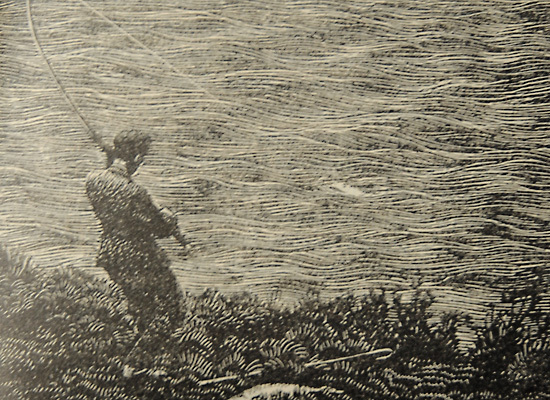 George Bowling, the main character in this book looks back at his childhood and recounts his memories of fishing at the turn of the twentieth century, then as adulthood beckons for George so does the great war. After surviving the war, George moves from job to job and finds himself middle age, over weight and astray. He realises he has lost something that he can’t get back, a sense of freedom, something he only had when he was a boy, doing boys things like robbing birds nests, playing conker’s, larking about and fishing. So George decides to…. My second hand copy has the inscription on the inside cover ‘Jonty, Happy unemployment, Love Liz & Annette. June 1982’ and slotted in the middle of the book is an old train ticket from 1996. 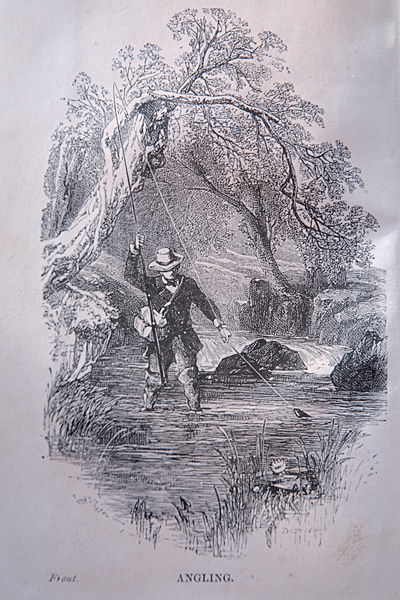 Perhaps Jonty was also in search of something, maybe a lost carp pool hidden in deepest Surrey somewhere along the Bookham to Horsley line? It just took him fourteen years to get around to looking for it. 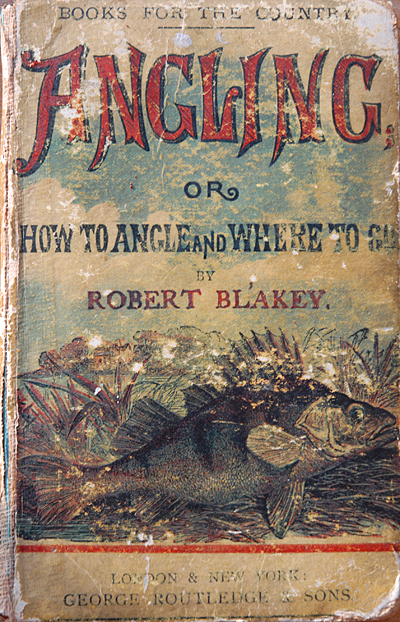 Currently there appears to be a trend for publishers to fill the market with angling liturature written by anglers who like to tread in the hallowed steps of anglers/writers like Yates, Walker, Venables etc etc. These books on first inspection can be beautifully produced, normally with some very fine photography and illustrations but when one starts to read these books I get bored very quickly. These fishy tales seems to come from a very familiar yarn of searching for lost ponds and time spent pouring tea and eating cake while slagging off the ‘bivvy brigade’ (an easy target if there was ever one to have a go at!) and talk of a bygone era that has never been experienced first hand, these books never seem to have a direction they just meander just like the rivers they fish. Also these authors tend to run out of steam quite quickly so the final few chapters have the presence of the publishers cracking the whip to get the book finished in time for the ‘launch’ so a moribund account of angling tales conclude these titles. Then you have the launch, men queueing up to a get as many limited editions copies signed ready to load up onto the Bay of E! There are some great current angling writers out there at present, Chris Yates’s almost child-like and enthusiastic view of the world and angling to crafted literature like Luke Jenning’s ‘Bloodknots’ and John Andrew’s ‘For Those Left behind’. Luke’s book is a real page turner due to the intreguing plot and characters while John’s book has a far more personal touch but both of these books have been written with care, time has been spent, each sentence has been considered very carefully, these are not rushed books. I think this is why we are still waiting for another book from both of these authors! Another good ‘page turner’ that springs to mind is Jon Berry’s ‘Benneath the Black Water’ which takes the reader along a journey of obsession with catching ferox trout at the expense of his personal relationships and the financial demands. Jon has written some other books and I have heard good things but I have not yet got around to reading them. Dexter Petley is another fantastic author who has penned many books but has only really touched on angling with articles for Waterlog magazine (when Waterlog was a credible publication). I wish Dexter would write some more on angling, his pieces on fishing the Walthamstow reservoirs in the 1980’s are as dark and brooding and the reservoirs themselves…superb. There is an antidote to the ‘fruit cake’ authors as I like to call them by tracking down angling liturature from the era that most of my old fishing tackle comes from, the pre and post second world war era. 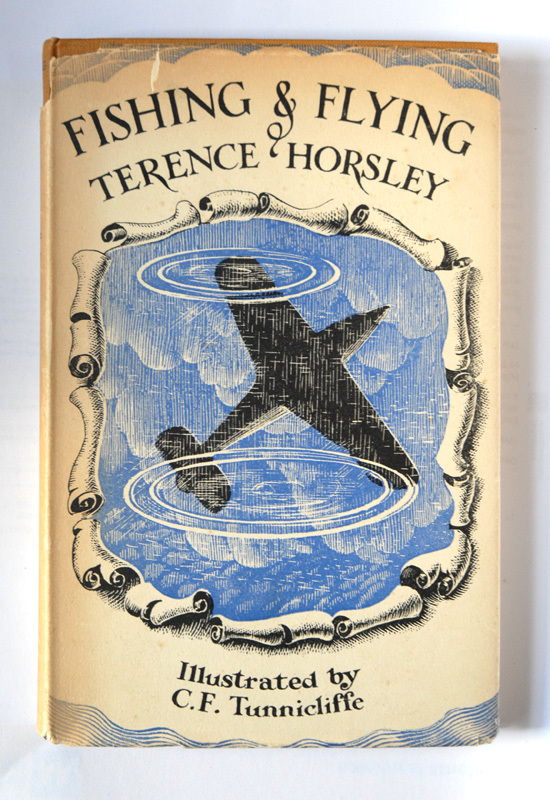 One such book is Fishing and Flying by Terence Horsley with illustrations by T F Tunnicliffe. Fishing and Flying starts off with a whirlwind tour of Britain in the air from the cockpit of his Spitfire, yes Terence is a World War II pilot and a keen fisher especially for sea trout at night. 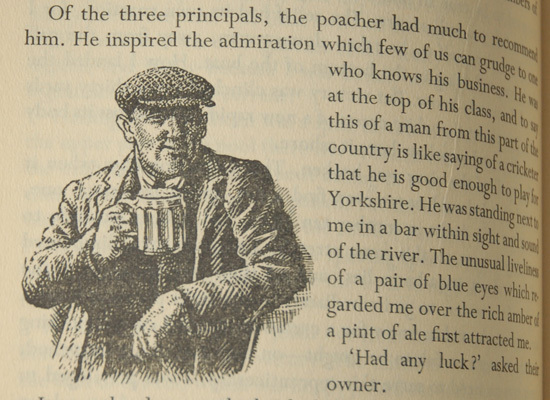 Every page is rich with descriptions of his experiences in the air, by the river or simply his encounters with people like the poacher in the local pub over a pint. At this time of year a good pile of books is required for fireside reading, there are plenty of books out there at present that can be used to feed the fire, I hope to list some books here over the next few months that are good to read!